(Author's Note: Since my next major column/review is still in the works, please enjoy this “Close Visual Analysis” assignment I completed for my Leonardo da Vinci seminar last fall. I guess this work sort of counts as an individual painting review! Painted by the Netherlandish artist Rogier van der Weyden in oil on a wood panel, The Crucifixion, with the Virgin and Saint John the Evangelist Mourning dates from circa 1460. A diptych, or two panels, this work is located in the Philadelphia Museum of Art in Philadelphia, PA. The work is also referred to in some circles, appropriately, as the Philadelphia Crucifixion, or, the Philadelphia Diptych. The work is painted in shimmering, saturated yet muted tones that create an atmosphere of grief and unearthliness. The rightmost panel of the diptych depicts the dead Christ nailed to a cross in front of a blood-red cloth, which in turn is draped onto a somber gray wall. A skull and a bone rest by the base of the crucifix. Blood trails from Christ’s wounds; he is horribly, horribly dead. The leftmost panel depicts the distraught and grieving Virgin, clad in a pale, unearthly blue, crumpling into a faint. She is supported by the pale pink-clad John, who looks in the direction of Christ figure with a mournful expression as tears drip down his face. The figure groupings are each also placed in front of a bright red cloth that rests on a gray wall. 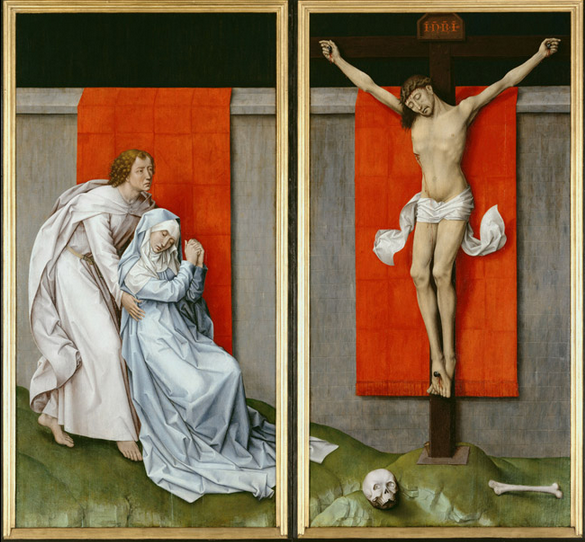 Though the work is divided into two panels, the unnatural green ground beneath the figures, the gray wall, and the Virgin’s robe extending into the panel featuring the crucified Christ unifies the composition. The painting suggests that there is a deep, meaningful connection between Christ and the Church, and, more importantly, that the way for humanity to reach Christ and salvation is through the Church. The figure of Christ is important to examine when discerning the meaning of the work. The crucified Christ is depicted in his own panel of the diptych. He is separated from the Virgin Mary and Saint John the Evangelist, establishing a clear divide between the world of the living and the world of the dead, between humanity and the truly holy and heavenly. Christ is depicted as clearly dead, or he has just died. Blood gushes from his wounds on his forehead, his side, and on his hands and feet. The gore and violence he has just faced is reflected in the blood-red cloth on the gray wall behind him. His lifeless face wears a slightly mournful expression, referencing his immense suffering. He has likely just cried out, in the biblical tradition, “My God, My God, why have you forsaken me?” Christ’s skin is yellowish and sallow, and his eyes are slits rolled back into his skull. His mouth is barely open as his last breath leaves his lungs and passes through his lips. His head is tilted towards the Virgin, located in the opposite panel, and his sight line echoes the tilt of his head. His body is illuminated in a cold, bright light, as is the rest of the painting. In addition, his body, strangely enough, is not collapsed and sunken, as would happen in real life to a crucified body. Instead his chest is lifted; his body is expanding and uplifted, suggesting both life after death and the immortality of his spirit and his message. In addition, his white loincloth is drifting upwards, indicating that his soul is rising towards heaven. In the opposite panel, the Virgin Mary is depicted collapsing in the arms of Saint John in reaction to her son’s death. In this work, she serves as Christ’s co-redemptrix, a traditional role for the Virgin. As such, she shares the Passion of Christ and his pain and suffering, and she is his church and the bearer of his message. In this work, the Virgin’s brow is furrowed in pain and her mouth is pinched. Her face is dripping with tears. Bathed in cold light that characterizes the rest of the work, she wears a pale blue robe that reflects her emotional state with its agitated twists and folds. Her robe trails into the panel with Christ’s crucifixion, emphasizing the link between the worlds of the living and the dead. The Virgin’s head is tilted towards her son’s; their heads visually rhyme. Their heads link the two panels. They bridge the gap between the world of the dead and the world of the living. They suggest a direct connection between Christ and his church, and, with the Virgin’s cloak, reinforce the message that there is a tangible, natural link between Christ and church, and that the way to reach Christ and salvation is through the church. In addition, the Virgin’s gaze is directed towards the skull by the base of the cross in the panel with Christ, thus doubly linking the two panels. Skulls, in crucifixion scenes, combined with bones, harken back to Adam, the first man, whose sins Christ has paid for with his life. Thus, Adam is a reference to humanity, who can reach Christ and salvation only through the Church. The Virgin’s gaze thus directly interacts with a relic of humanity, creating the link between humanity and Christ. The eye, as a result, is intrigued by these connections and is constantly drawn around the work, a circuit that strengthens and reinforces the message. The figure of Saint John is the audience’s, and humanity’s, thematic link into the painting. He supports the figure of the Virgin and gazes out towards the figure of Christ in the opposite panel. Tears run down his face, and his brow is furrowed in deep thought and sadness. The green ground beneath his feet is unsteady and sloping, which is reflected in his face. He is bathed in light, like the rest of the diptych composition, and is clothed in a pale rosy pink robe. Traditionally, the Virgin and Saint John are clothed in bright blues and reds, respectively. In this work, however, their robes are the palest shade of their respective colors. In addition, as the Virgin’s cloak trails into the panel with Christ, it becomes even closer to white. This stylistic choice reflects the purpose for which the painting was made. Van der Weyden painted this Crucifixion for the Carthusians to commemorate his son’s entrance into that order. The Carthusians’ robes were, in fact, white, the color that Christ himself is wearing. The posing of Saint John directly supporting the Virgin thus has several layers of meaning: that only through the Church can humanity, represented by Saint John, reach Christ and salvation, but also that it is the duty of humanity to support and love the Church, and, in addition, the Carthusians have an especially strong link to the Church and to Christ. The latter is suggested by the paleness of the robes of the Virgin and of Saint John, which are a direct reference to the white robes of the order. The traditional dark red of Saint John’s clothing is in this work reflected instead in the deep blood-red cloths that frame the two figure groups in the diptych. What is also interesting to note is that the part of the Virgin’s cloak that occupies Christ’s panel is almost completely white. In the panel she occupies, her clothing is a definite pale blue, but in the panel with Christ, her clothing is white, with the blue tinge as almost an afterthought. This stylistic choice creates a visual link with Christ’s loincloth and suggests more directly a link among the Church, Christ, and the Carthusians. The ground upon which the figures are grouped, that sloping, oddly green surface, is separated from the viewer via the depiction of a sort of cliff. The viewer is physically cut off from the scene which is taking place, and thus the viewer, in this case the Carthusians, takes Saint John as their avatar, so to speak, or their thematic link into the work. In addition, the familial significance of the theme gives the work more emotional poignancy, since Van der Weyden’s son was leaving home to join the Carthusians. Perhaps this painting would serve as a reminder for both father and son of the deep connection between a parent and their child. Thus, The Crucifixion, with the Virgin and Saint John the Evangelist Mourning has a clear message: humanity can reach Christ only through the support and love of the Church. This theme is illustrated in the gesture and color used in the principal figures of the work. To understand this theme, it is important to study the figures and how they relate to one another carefully. The gestural visual rhyme of the heads of the Virgin and Christ, as well as the continuity created by the Virgin’s cloak as well as the ground and the wall, create the immediate and apparent link between the Church and Christ, because not only is the Virgin the co-redemptrix, she is also Maria Ecclesia. The figure of Saint John supporting the Virgin is also significant in that it delivers the message to the painting’s audience that it is their job, and humanity’s job, to support and love the Church, and that through this faith and devotion to the Church can Christ be reached and salvation achieved. In addition, a direct connection to the Carthusian order, the intended audience of the work, is suggested through the portrayal of the robes of the figures. Saint John is the avatar of both humanity and of the Carthusian order in this work, and the Carthusian connection is stressed in the white of Christ’s loincloth as well as the atypical paleness of the garments of the Virgin and Saint John. All of these elements help to create a truly powerful painting with a meaningful and spiritual message. This masterpiece suggests that it is only through the Church that humanity can reach Christ and salvation in heaven, and it is a very compelling message indeed. 1. Tamytha Cameron Smith, "Personal Passions and Carthusian Influences Present in Rogier van der Weyden’s Crucified Christ Between the Virgin and Saint John and Diptych of the Crucifixion". (University of Texas, Master of Arts Thesis, Art History, 2006), 1.